England vice-captain Heather Knight looks back at the highs and lows of the latter stages of the Women's World Twenty20 - on and off the field. As a group, we know how privileged we are to play cricket around the world and sometimes we get to meet some amazing people along the way. The day after our group game against India, we were lucky enough to get the opportunity to meet the 14th Dalai Lama, who lives up in the hills in Dharamsala. What an amazing experience. Beforehand, we weren't entirely sure how to greet him, as we had heard he sees himself as no more superior to anyone else and doesn't like special treatment. I was second in line to meet him behind Danni Wyatt, who had snuck to the front and nominated herself as captain for the day. I'll bet it's the first time he's been greeted in true Stoke fashion with an 'Ayup'! He asked me if we had won the previous day and after telling him we had, he gave me a big slap on the back. With remarkable force for an 80-year-old man, may I add. After that I took the opportunity to give him a high five; I think that might be a story for the grandkids! Once he had greeted everyone, he spoke to us enthrallingly about how compassion is a basic human nature and although we are different, we are all human and should show solidarity. He was riveting to listen to, and it won't be an experience I will forget for a while. Maybe the Dalai Lama was on our side for our game against West Indies the following day, as we managed to sneak over the line and win off the final ball of the game. Another nail-biter watching from the dug-out, and after clinging on to a drinks bottle while watching the last few overs, I managed to fling it straight at the head of poor Matt, the Getty Images photographer who had been snapping our match! After writing about the good old stories of "Delhi belly" from previous tours in my last column, I think I may have been victim of a bit of karma… as I was struck down with a pretty bad dose of sickness after the West Indies game, which caused me to miss the next game against Pakistan in Chennai. Not fun! I've certainly learnt my lesson. Although our media manager Beth Barrett-Wild took a lot of delight in being able to use the "poo emoji" in an official @Englandcricket tweet to inform people about my plight. Thanks Beth! After keeping our 100% win record in the group stages by beating Pakistan, it was back on another flight up to Delhi for the semi-final against Australia. Unfortunately it wasn't to be and we fell five runs short in the run chase. After being in a great position, it was a disappointing end that hurts a lot, but we just couldn't get over the line on the day. Once the dust has settled, I think we'll take a massive amount from this tournament. There's a lot of work to put in to be where we want to be as a team, and make sure next time in that same situation we do get over the line. Despite the end, I really enjoyed the tournament in India. It's a testing, but great place to play cricket. Although watching the women's final from a sofa back home wasn't the easiest, I was really pleased that the final was a cracker of a game. Congratulations to Stafanie Taylor and the West Indies on winning the trophy, they put together a great run chase to beat the Australians. It was nice to see my Hobart Hurricanes team-mate Hayley Matthews pick up the player of the match award - she's a seriously talented cricketer and one of the cleanest strikers of a ball I've seen. It was also gutting to see the men's final finish like it did for England. I really felt for Stokesy, but it takes guts to put yourself out there and bowl that last over. It was some serious striking by Carlos Brathwaite and at the end of the day that's Twenty20 cricket for you. What a final it was, though. The next ICC Women's World T20 is a standalone event in the West Indies in 2018, as the men's tournament now moves to a four-year cycle, and I think it's a massively exciting opportunity for the women's game. The semi-finals and finals, which were played as double-headers this year, had worse crowds than some of our standalone group games and it's exciting to see how the tournament will go when it stands by itself. Last of all, thanks to everyone for their support during the competition, it's been unreal. Roll on the English summer. 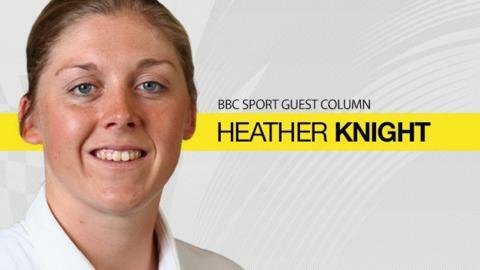 Heather will be captaining the Western Storm in this summer's inaugural Kia Super League - read more from her on the BBC Sport website during the summer, when England will also host Pakistan in a limited-overs series.